Ubisoft’s Far Cry 5 is less than a month away, and I had the opportunity to return to its rural open world at a preview event. For those unacquainted, Far Cry 5 takes place in the fictional Hope County, Montana. Joseph Seed, also known as “The Father,” has taken over the land with his cult, the Project at Eden’s Gate. His siblings John, Jacob, and Faith – the “Heralds” – each control a region. You play as a junior deputy who is tasked with helping the resistance put an end to the cult’s influence. I played through two areas in the demo. The first was a safer tutorial region controlled by an ally named Dutch. Here, I learned the basics through five tutorial missions, which involved shooting down enemies, running to locations, and shutting down a tower. Unlike other Far Cry games, liberating towers won’t be a primary focus, and Dutch even makes a tongue-in-cheek joke about this. Though I was free to explore this area, I focused on completing the story missions, which took approximately 40 minutes. Preceding that, I also watched the intro, which did excellently portrayed Joseph as a menacing megalomaniac. Here is my interview with Darryl Long, Producer of Far Cry 5. Dutch’s centralized zone is surrounded by the three major regions, each of which is a massive landmass that encompasses at least 10 hours of narrative content. During my last preview, I explored Holland Valley, a region controlled by the Herald John. This time, my focus was on the Whitetail Mountains, Jacob’s region. There were three story missions to choose from, and each one allowed me to recruit a unique character as a gun-for-hire. One mission involves liberating a lumber mill to recruit Jess, a woman related to Dutch, and another allows you to befriend Hurk, a character that might be familiar to series veterans. I was most drawn to the F.A.N.G. Center to free and befriend Cheeseburger, a burger-eating bear whose diabetes has limited him to a salmon-only diet. My first objective in this multi-layered mission was to catch a salmon. The fishing mechanics were easy to learn. The relaxing pasttime, alongside hunting, provide fun breaks between the intense shootout sequences. Speaking of which, in the next act, I infiltrated the animal center. Through a mix of crouch walking and silent takedowns at the press of a button, I stealthily eliminated cultists one by one. A handy indicator next to your character tells you how close someone is to discovering you. Even though I was eventually spotted and had to resort to shoot and cover tactics, I was able to get through it thanks to the helpful weapon wheel user interface. I had no issues switching between different guns and throwable items such as Molotovs. Once I finally saved Cheeseburger, it was a treat to watch him ruthlessly bite his foes and chuck them away. Adorably enough, I could pet the bear for a job well done. Also hidden within Jacob’s region is the Whitetail Militia, a group bent on taking down the cultists. However, you don’t simply find them. Rather, they find you. According to creative director, Dan Hay, the militia watches your movement and chooses to encounter you based on your actions. After completing two story missions, I was en route to the next, when all of a sudden, I woke up in a burning building. There I met the militia, who sent me on another task that culminated with rocket launchers blowing up helicopters. The seemingly random nature of the Whitetail Militia is just one part of a bigger dynamic mechanic in place: the Resistance Meter. As you perform actions against the cult, be it completing missions or liberating cult outposts, you will accumulate points on the Resistance Meter. It’s not just a progress tracker though; it actually changes how the cult reacts to you. As you push against the Heralds, they will push back, change their tactics, and seek you out as a threat. Once a region’s meter is filled, you can face the respective Herald once and for all. You can progress in any order you wish and even jump between districts. Each region will have a separate meter, but the three are interrelated. Producer Darryl Long explains that this is partly due to the game’s economy system; each Herald has a different objective. For instance, John is reaping the people and resources, Jacob is building the army, and Faith is collecting bliss, which is the mind-altering drug used to brainwash the cult members. By making progress in one area, a Herald may also provide more resources to another. As a result, if you enter John’s region first and build up his meter, you may find Jacob’s region to be much tougher later. Conversely, another player may go in the reverse order and consequently find John’s region to be more difficult. In the same vein, the new Intel system changes how the game unfolds. This replaces the artificial tower mechanics of past games with a more realistic feel. As you explore the open world, you encounter all kinds of people who have had different exposures to the cult. As a result, each person will have slightly different information to share based on what they remember or have seen. They may not necessarily know the full story, but as you talk to multiple people, you piece together the big picture. Essentially, you set the pace for the story because the Intel you acquire will be entirely based on who you talk to and when you encounter them. This knowledge-building is extended to signs around the world and notes scattered about, resulting in a more organic experience. I also had a chance to play co-op. It was a seamless transition, as my partner simply jumped into my game and we worked on the same missions that I would have tackled alone. The entire single-player campaign can be played in two-player co-op. Although it’s still unclear how progress will apply to each player’s file, I’m pleased to say that the gameplay was smoother than before. We had no issues saving hostages and defeating cultists together. And of course, driving a truck while my teammate shot enemies was a great bonding experience. Although I enjoyed playing the previous build, I had even more fun with this latest demo for Far Cry 5. By having access to an entirely different region from before, I had a better sense of how the working mechanics, particularly the Resistance Meter and Intel, interplayed. The vast, open world of rural Montana remains gorgeous, and I was happy to take my customized character to its dynamic landscape. 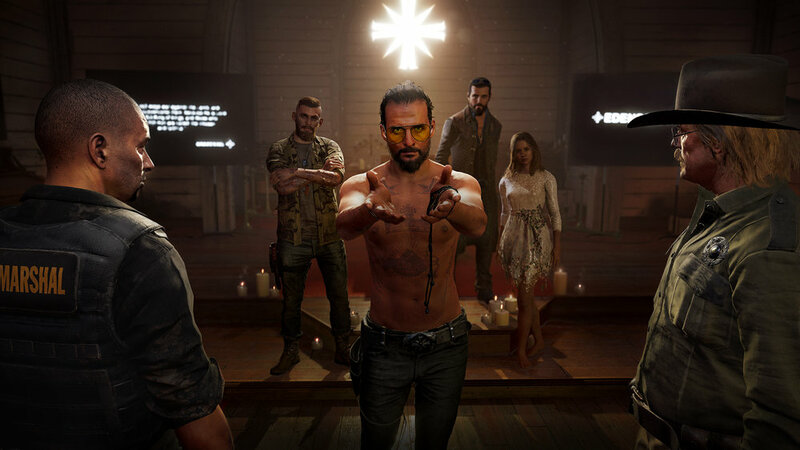 Players will be able to explore Hope County and face Joseph Seed’s cult when Far Cry 5 launches on March 27.